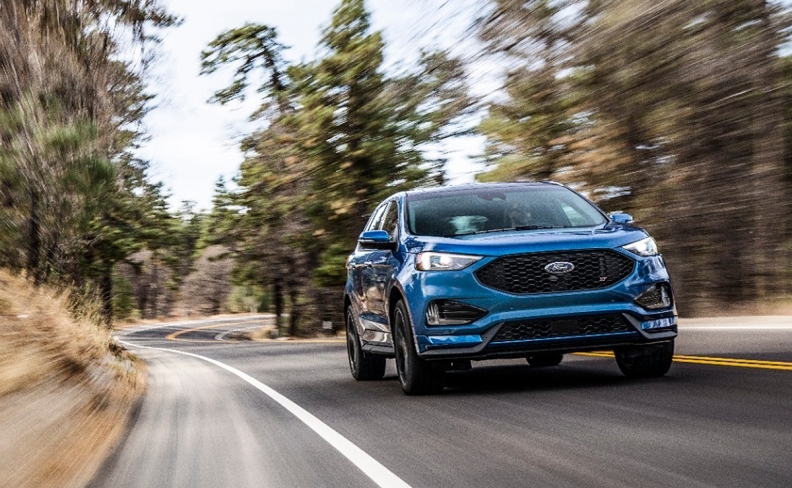 The 2019 Edge ST has a black mesh grille, specifically tuned suspension, standard all-wheel drive, special badging and performance seats. Ford Motor Co.'s upcoming 2019 Edge ST -- the automaker's first crossover to carry a performance badge -- will cost about $2,300 more than the outgoing Edge Sport trim it replaces. The Canada-made midsize crossover, on sale later this year, will start at $49,099. The outgoing Edge Sport trim starts at $47,799. Ford Canada hasn’t yet said how much the destination fee is for the 2019 Edge ST.
Ford Canada has released few other Canadian details about the vehicle, which is assembled in Oakville, Ont. However, Automotive News in Detroit has viewed a U.S. pricing sheet released to the automaker’s American dealers. According to that information, the ST includes an optional brake package that costs US$2,695 and comes with 18-inch disc brakes and 21-inch black aluminum wheels. The brake package is part of a larger equipment group that costs an additional US$5,585 and includes Ford's newly branded Co-Pilot360 collection of driver-assist features, heated and cooled seats and a hands-free liftgate. The vehicle also has a black mesh grille, specifically tuned suspension, standard all-wheel drive, special badging and performance seats. The Edge ST will be powered by a specially tuned 2.7-litre EcoBoost V-6 engine that Ford says is the most powerful in the segment, generating 335 hp and 380 pound-feet of torque, specifications that are listed on Ford Canada’s webpage promoting the new vehicle. While it competes in a midsize crossover segment with vehicles such as the Subaru Outback and Honda Pilot, Ford is targeting performance-oriented luxury vehicles from Jaguar, Mercedes-Benz and Porche, noting the Edge ST costs less and delivers similar, if not greater, performance numbers. Fuel economy figures have not yet been released. CarsDirect first reported the U.S. pricing news. The Edge ST is part of a freshening that includes slight cosmetic changes to the base model Edge. Ford said it has sold 1.3 million Edge crossovers since 2006. That includes Canadian sales of 47,880 in 2017, good for a 2.6 per cent increase over the year before. U.S. sales hit 142,603 in 2017, a six percent gain over 2016, according to the Automotive News Data Center in Detroit. Canadian sales are down 5.7 through the first half of 2018 while U.S. sales are down 4.5 per cent.